The services of Oasis Center are now available to those pre-qualified members of the community who need and want these services, whether or not they have been involved within the criminal justice system. 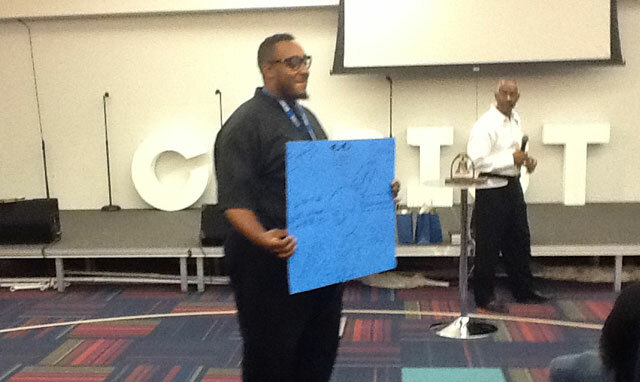 Oasis’ initial focus was to provide First Time Youth Offenders with highly qualified criminal legal assistance. 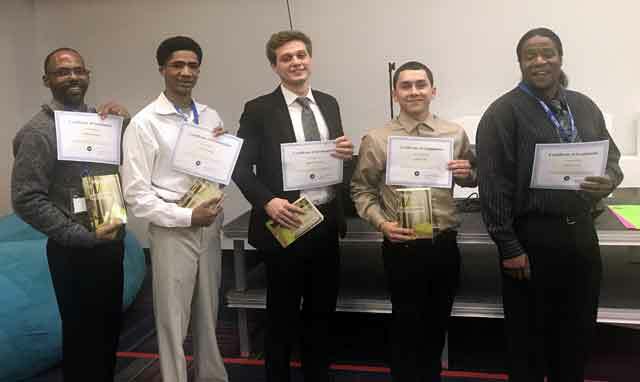 Our premise was to give these youth a "second chance" to become productive citizens, without the burden of a criminal conviction on their records. By 2003, we found that there was an increase in the number of youth demonstrating criminal behavior who also had a parent or parents who were already involved within the criminal justice system. It has been Oasis’ goal from our first day of ministry to assist and walk along side of those who face some of the most difficult challenges in transitioning back into our communities. To provide life changing programs and services to first time youth offenders and formerly incarcerated persons. To create a spiritual and social "model program" that can be replicated and scaled. "Oasis Center has been successful in providing a second chance to hundreds of youth." 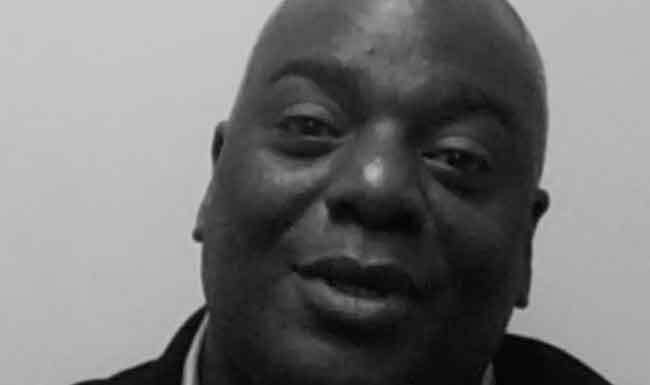 "I understand the challenges facing formerly incarcerated persons." The programs of Oasis Center focus on low/moderate income members of our community, but are open to all who express the desire for change and make a commitment to attending our life skills and cognitive classes. Our Reentry Discipleship Program is provided for two hours, two days per week for 10-12 weeks. Our Job Readiness Work Camp is seven hours per day (9:00-4:00 pm), eight-day job readiness and preparation for skill certification and career placement program. Oasis also provides a first-time youth offender program, and criminal legal assistance for youth and adult program participants. Each person participating in the Reentry Discipleship Program is provided a formal assessment to help determine the level of services he/she will require. Identifying both surface and underlying challenges facing a participant and his/her needs towards sustained success in life is essential in identifying our ability to assist. This service is reserved for Reentry Participants who complete an assessment. The assessment will determine the curriculum, and program measurements required for each participant. This service includes three different programs. TYRO is a dynamic cognitive behavior modification course. 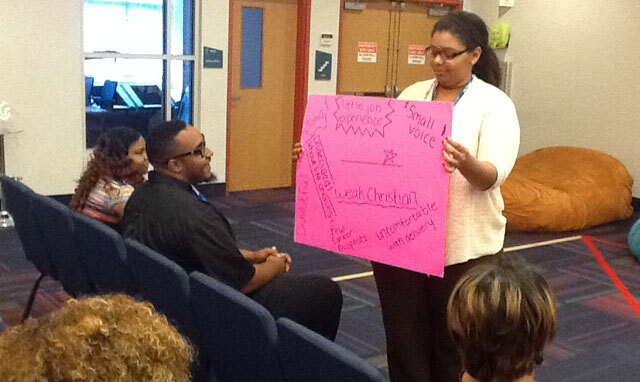 The Fatherhood Initiative is designed to strengthen the bond between a Dad and his family. The Universal Church Partnership provides a new local family that can help sustain access to services and acquired values for the “inner man/woman”. For youth ages 12-25 years of age who are experiencing their first brush with the criminal justice system and are being charged with a Class A misdemeanor or Felony charge, Oasis will consider a referral to experienced criminal attorney partners. 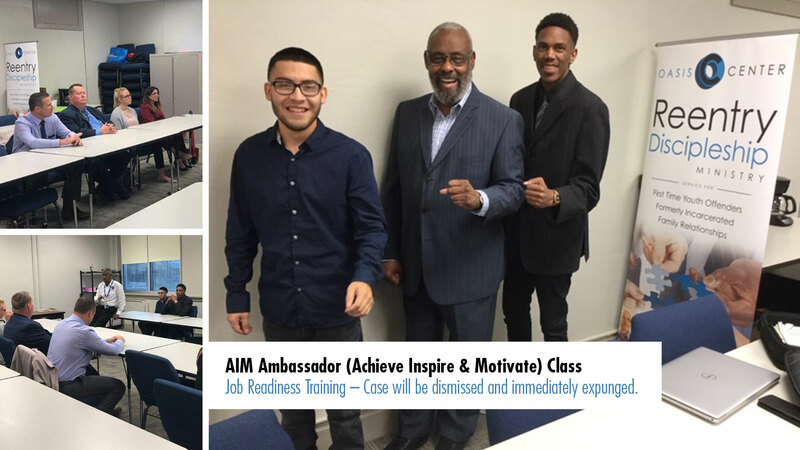 Oasis also partners with the Achieve Inspire Motivate (AIM Program), which targets young, non-violent offenders. 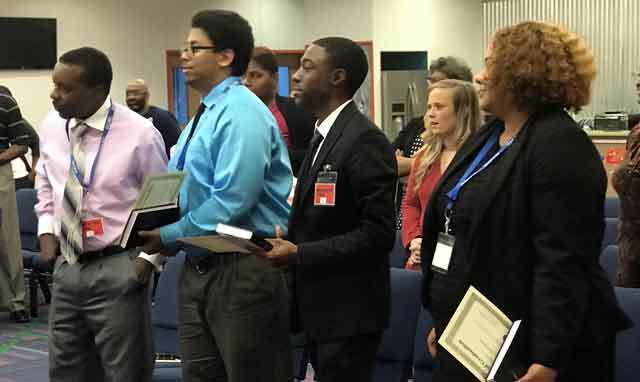 Upon successful completion of the AIM Program, which for several participants includes the successful completion of the Oasis Work Camp, the young adults can have their criminal record expunged. 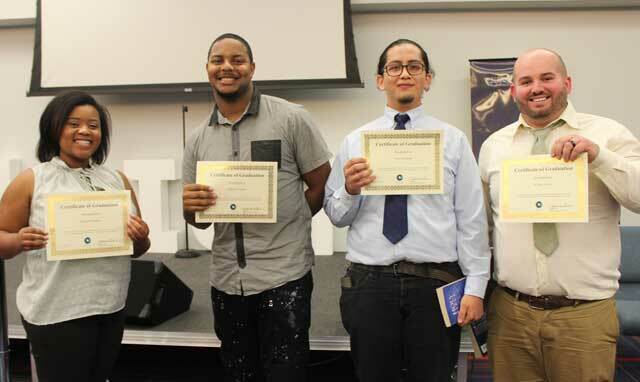 Recognized as a “Model Reentry Program” by the Faith and Philanthropy Institute, the Oasis Reentry Program is a compilation of several distinct programs and partners collaborating for sustained change for the reentry participant and family members. Oasis utilizes peer-to-peer coaching because it provides former Oasis graduates with the opportunity to share life experiences and training received from Oasis with new participants. Oasis has a full time Employment Specialist who works with the program participants on a one-to-one basis to enhance their career opportunities; and remain available to both the participants and the employers to address placement related and/or retention issues. Oasis has several program options designed to help participants achieve success in acquiring a career paying “livable wages”. To ensure the participants are prepared to sustain the career, he/she completes courses in: communication, anger management/conflict resolution, monetary management, problem solving, and job readiness. Are you able to support Oasis Center programs and services? "I’ve got my life together and I don’t smoke anymore. 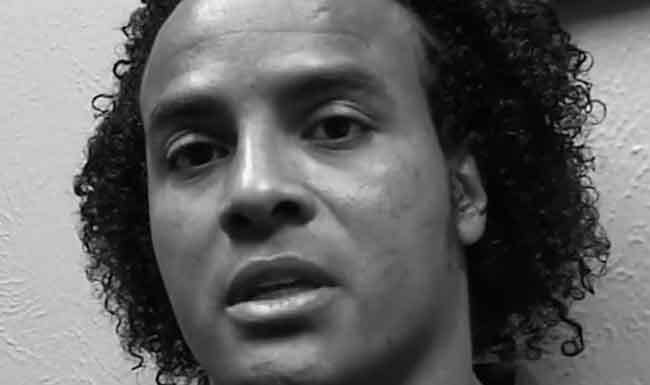 I believe in Christ and I have a much better life." "I’ve accomplished a lot with Oasis. I was lost and did not know what I could do in life." 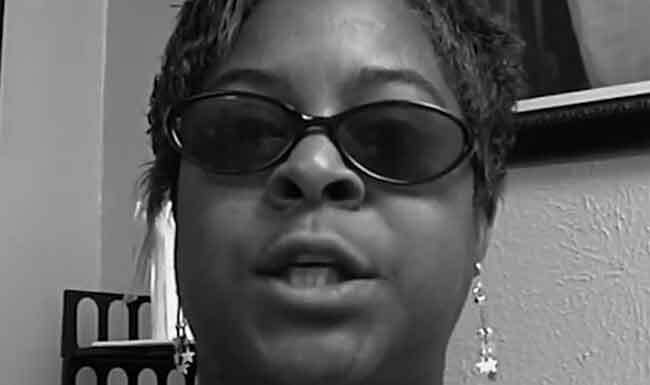 "I have experienced honest living due to being a weekly participant in the Oasis program." 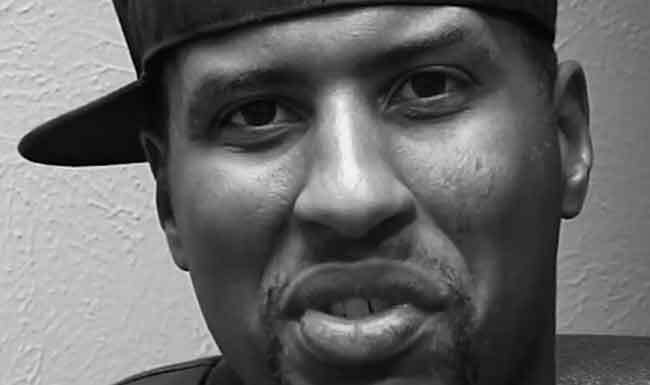 " would be back on the streets doing old habits if it were not for the Oasis program. I’ve learned a lot about myself." Click a video testimonial above or read testimonial below. "program helped me with legal assistance, counseling..."
"Oasis is more than a program to me, it is family. When you are going through something you could have never imagined, it's hard to find someone to call. Not only was I able to call Oasis, Mrs. Juanita Lee called me several times a day to check on me, get updates about my situation, and most importantly pray with me. The program helped me with legal assistance, counseling referrals, and a mentor for my son. To me Oasis is not only the village that we all need, it is salt and light. They have been a true blessing from God to my family and I." "lost and did not know what I could do in life..."
"I’ve accomplished a lot with Oasis. I was lost and did not know what I could do in life. It made me want to just give up. Still I came to Oasis, and now I am walking with my head high in life." "deal with personal relationships in a more positive way..."
"The Oasis program has meant the world to me and my children. It has helped me to learn how to deal with personal relationships in a more positive way. It has also helped me learn how to have a more intimate relationship with my Higher Power and to trust in Him. It is a blessing to be able to participate in a program like Oasis. I’m truly thankful." "focused on God and to not get discouraged..."
"I would be back on the streets doing old habits if it were not for the Oasis program. I’ve learned a lot about myself. 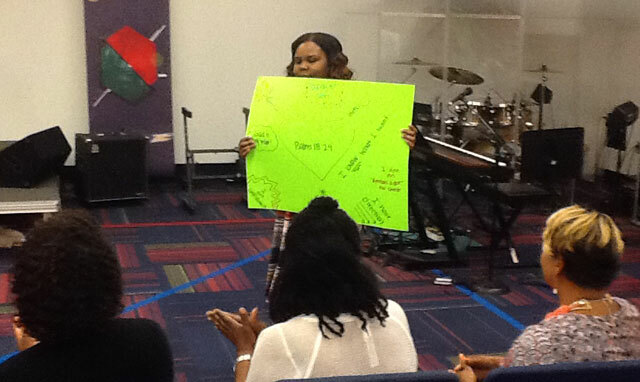 The program has really helped me stay focused on God and to not get discouraged about my past. I would recommend it for other people." "nothing less than the greatest support team..."
"If it were not for Oasis I don’t really know where I would be today. The thing that comes to mind first would be the support they give throughout all of the mishaps and setbacks. Mr. Bowman, Ms. Vicki, and Mr. Dillon and staff have been nothing less than the greatest support team I have ever had. Thank You." "understand things I did not understand before..."
"I would like to thank Oasis because it has been good for me. I would be living on the streets, breaking the law if Oasis had not helped me a lot. I really understand things now that I did not understand before I came to Oasis." "headed down the wrong side..."
"Before I got into the Oasis program, I was smoking and had bad behavior. But Jeff and Vicki have helped me wake up and see that I was headed down the wrong side. Now I’ve got my life together and I don’t smoke anymore. I believe in Christ and I have a much better life. I thank the Oasis program for everything they have done for me and the work that they continue to do for others." 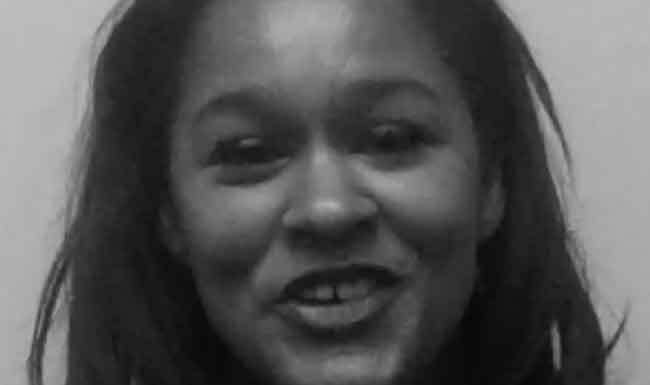 "I have experienced honest living due to being a weekly participant in the Oasis program. Seeing people that have overcome adversity or trials due to the classes that I have attended at Oasis was a revelation." "helped me become more responsible..."
"The program has helped me become more responsible in my life, as well as more spiritually and intellectually inclined. I thank the staff for their hard work, dedication, commitment and deep concern. I definitely advise others to make it their business to find this organization. I love you and thank you all very much." A team of highly trained individuals changing the way you experience the life. Overseeing the Oasis Center's life-changing program and services. 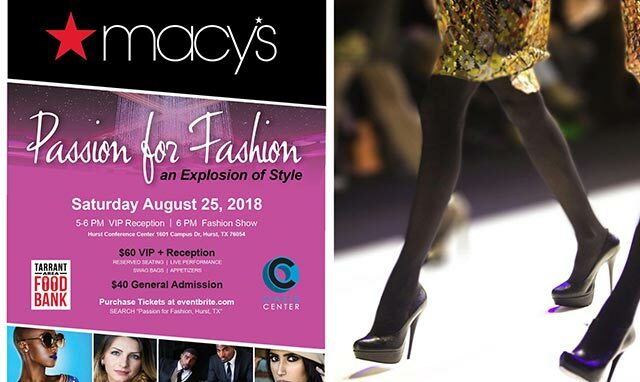 Stay in-the-know with Oasis Center and all that is happening! 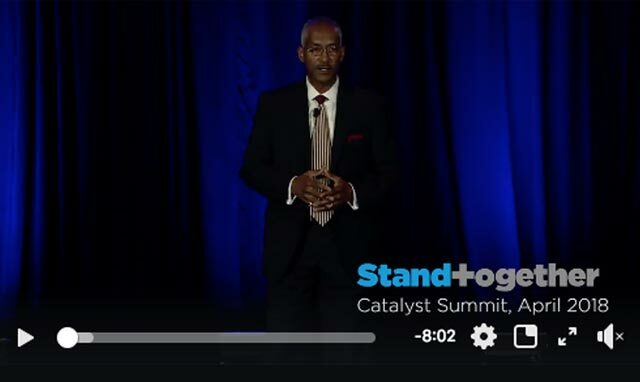 Stand Together conducts a six-month Catalyst Program for transformative, innovative organizations that are building sustainable solutions to the country’s toughest problems. The program provides access to resources, industry best practices, and a growing network of dynamic leaders. Industry experts lead interactive online sessions and guide participants through curriculum on topics such as organizational development, strategic partnerships, and measurement and growth. 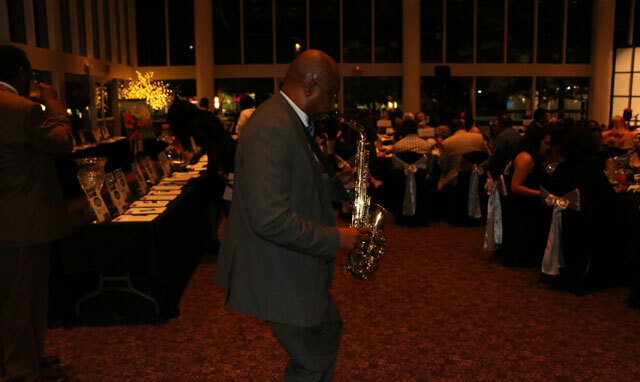 On Friday, April 20, 2018 Oasis Center hosted its 16th Annual Celebration Dinner at The Atrium at the Granville Arts Center, Garland, TX. Our sincere thanks to all of our Table Sponsors, Friends of Oasis Sponsors and Silent Auction Donors. Generous gifts, from donors like you, provide the financial and moral support needed to continue our mission. 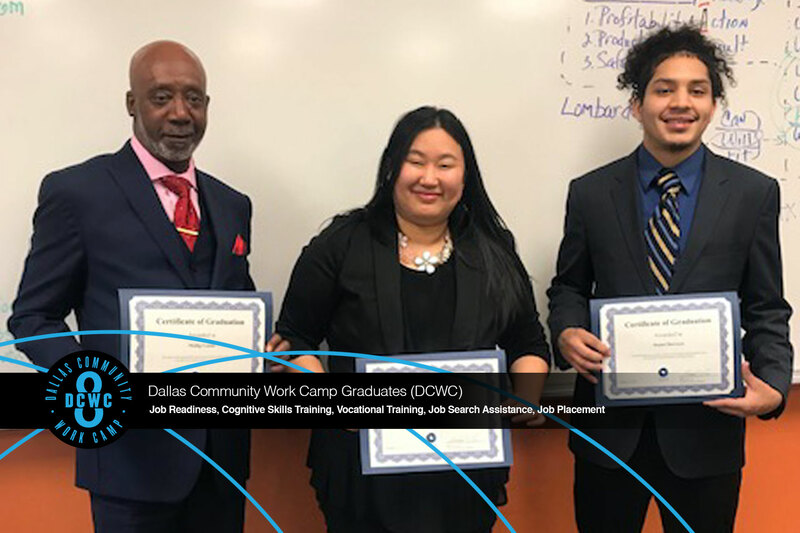 Dallas Community Work Camp (DCWC) Graduation Ceremony was held at NDCBF — DCWC is an intense 8 day camp; 7 hours per day that specializes in providing FREE classes in in job readiness, life skills, cognitive skills, resume writing, job search assistance, and job placement with corporate partners..
Kroger is committed to helping our communities grow and prosper. 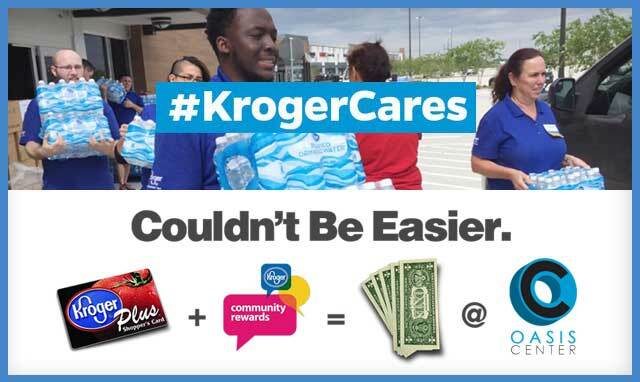 Year after year, local schools, churches and other nonprofit organizations like Oasis Center, will earn millions of dollars through Kroger Community Rewards when you swipe your Kroger Plus Card. Kroger Community Rewards makes fund-raising easy. Kroger Community Rewards - Customer Instructions A Digital Account is needed in order to participate in Kroger Community Rewards. If you already have a Digital Account, then please skip to the section named 'Selecting an Organization'. 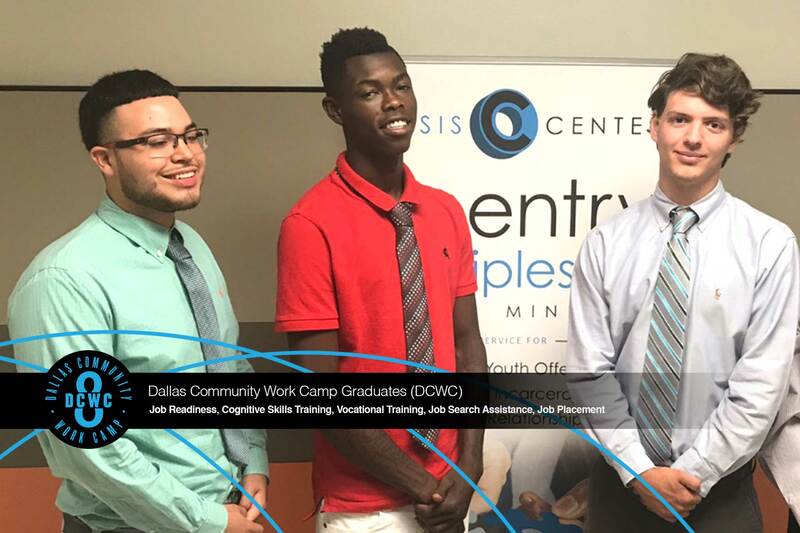 Dallas Community Work Camp (DCWC) Graduation Ceremony was held at NDCBF — DCWC is an intense 8 day camp; 8 hours per day that specializes in providing FREE classes in Job Readiness, Cognitive Skills Training, Vocational Training, Job Search Assistance and Job Placement. On Tuesday, September 26, 2017 we held our Annual Golf Classic fundraiser. It was a beautiful day of golf and fellowship at the award winning Canyon Creek Country Club, located in Richardson, Texas. 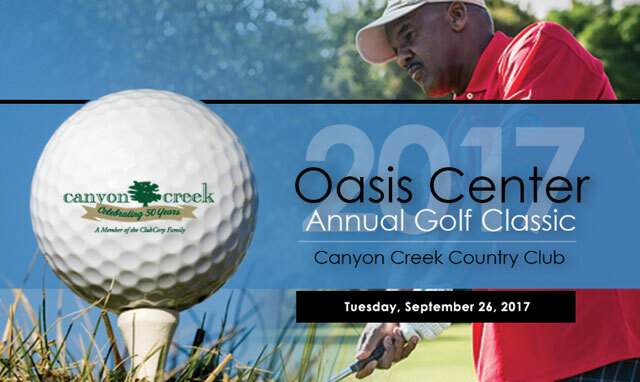 Thank you for your participation in the Oasis Golf Classic. Your support helped to make it a financial success”. JOHN CROCKER MEMORIAL SPONSORS Walmart and Sam’s Club; CART SPONSOR Bill and Debbie Dunlap; AWARDS LUNCHEON SPONSOR Al and Jan Hassler; GOODY BAG SPONSOR Drs. Terry and Nataki Hollingsworth; OASIS CORPORATE TEAM SPONSORS Legacy Texas Bank, Andrews and Barth, PC, Randy and Joanne Box, Jessica Jeffrey, Natasha Johnson, Kermit and Gwen Moore, Kevin Posey, and George and Christine Spencer; HOLE SPONSORS Justus and Dale Bey, Brian and Effie Dennison, Casa View Thrift, Gaye and Robert Holmes, H.W.C. Systems, Gil Jones, Metropolitan Press, Preston Center Rotary, Merchandise Pickup Service, Inc., Oil and Gas Business Solutions, Inc., Simon Spottswood, TaylorMade Factory Store, Telecom Electric Supply Company, and Unicorp. It is with sincere appreciation that we thank everyone who participated in North Texas Giving Day! Thank you for supporting Oasis Center and helping us raise $9,730 – triple the amount raised last year (2016). 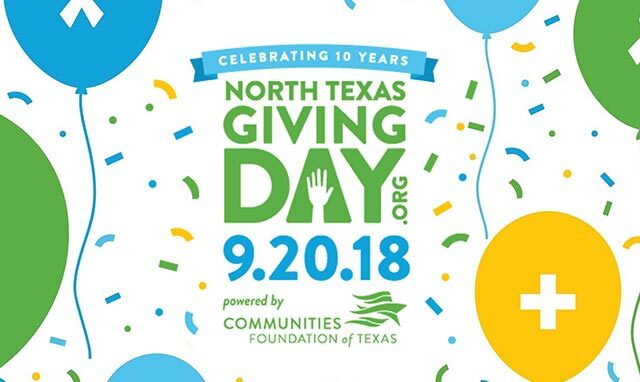 September 14, 2017 was North Texas Giving Day to raise money for local nonprofits community-wide giving challenge. 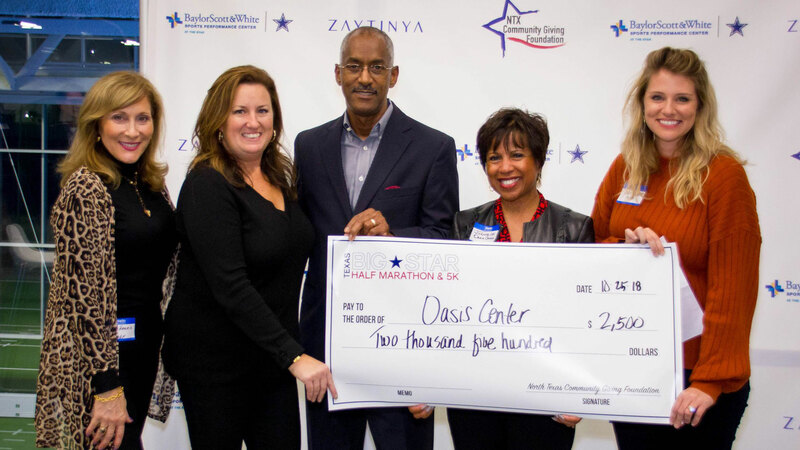 North Texas Giving Day is Communities Foundation of Texas' annual 18-hour online giving extravaganza for North Texas nonprofits like Oasis Center. Women's Celebration Dinner at Woodcreek Church in Richardson, Texas. 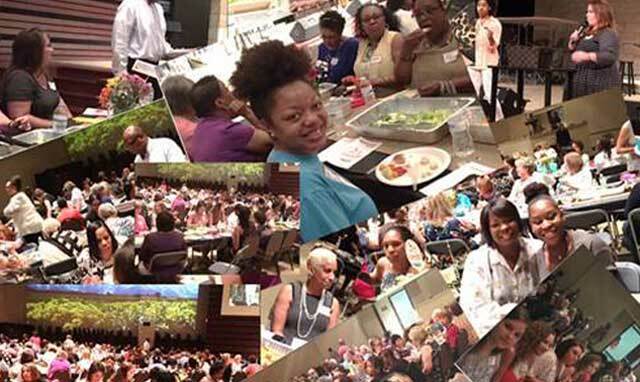 NDCBF and Woodcreek Church partnered together and planned a women’s event where approximately 350 women gathered to fellowship, eat dinner and hear a word from God from two female speakers. The proceeds of this dinner will be donated to Oasis Center. What a blessing!!! 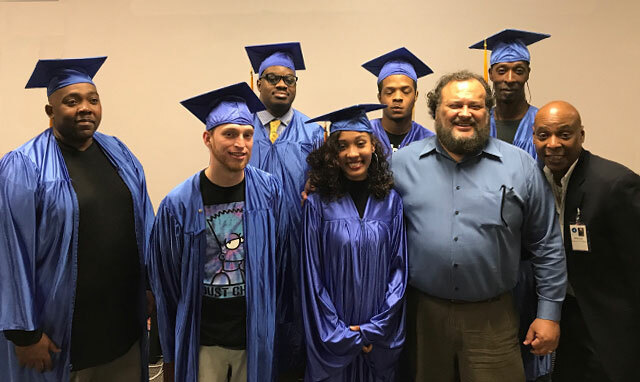 On Saturday, April 27, 2017, we recognized graduates of our TYRO program – a dynamic cognitive behavior modification course that is part of Oasis Center Relationship Training. The TYRO program is available to all qualified low/moderate income members of our community who express the desire for change and who commit to attending our life skills and cognitive classes. Our TYRO Champion Program and our faith based Reentry Discipleship Program average two hours per week for 12 weeks. On April 21, we held our Annual Celebration Dinner. Our continued growth and expansion is contingent upon those we partner with to provide life-changing programs and services. 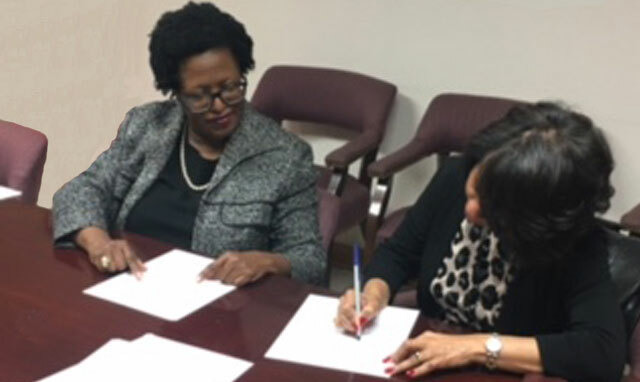 "Special Recognition to our Sponsors"
Chicago Legacy Group, L. P.
DeMetris Sampson, board chair of the Zan Wesley Holmes, Jr. Community Outreach Center, and Juanita Lee, Chief Fundraising Officer, Oasis Center sign a Memorandum Of Understanding (MOU) with Frazier House. Frazier House is shared resource model that will be housed in a former DISD Elementary School in the Fair Park/South Dallas Community. Frazier House is a first-of-its-kind in North Texas – one of four different centers that Oasis Center will be operating its Reentry Discipleship and Dallas Community Work Camps out of. Initially, five non-profits will house space shared with DISD with the mission to work in partnership to offer adult educational support programs, skills training, and coordinated social services designed to alleviate community problems arising from poverty, crime, unemployment, substance abuse, school failure, juvenile delinquency and the absence of healthy families. Frazier House will be one of four different centers that Oasis Center will be operating its Reentry Discipleship and Work Camp out of. Complete online form to contact one of our professional associates. The services of Oasis Center are now available to those pre-qualified members of the community who need and want these services. Our Prison Reentry Program now includes both faith-based and secular programming.